This luxury self catering apartment consists of a lounge, dining area and a fully fitted modern kitchen. There are two double bedrooms with a main en suite. The apartment can comfortably sleep four people. 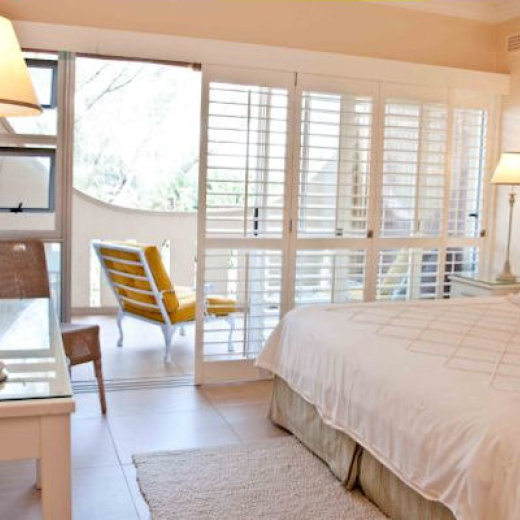 Off the lounge and the main bedroom are sliding doors onto a private patio with views of the sea. Sit on the patio and listen to the sounds of the ocean whilst enjoying your sundowners or that cup of coffee in the morning. The entire apartment is air conditioned and there is also a ceiling fan in the lounge and each of the bedrooms. 8 Wedgewood Terrace is situated directly across the road from the access to the main bathing beach (Bronze Beach) in Umhlanga Rocks. The apartment is in easy walking distance of the Umhlanga village. There are numerous hotels in the immediate vicinity where children can enjoy ten pin bowling, game arcades etc. Enjoy a walk along the 5 kilometer Promenade on the beach or a stroll along the nature trail through the Hawaan Forest.